During my self-esteem and body image workshops, I’ve had girls tell me they want to look like the size zero models in the magazines. They truly believed it was their ‘want’ and their desire, until I explained how media can manipulate their thoughts the same way the “Imperius Curse” can make a person believe and do certain things. What is the “Imperius Curse” you ask? It’s one of the Unforgivable Curses from the Harry Potter books and movies, and I have found that it is one sure-fire way to get girls to understand the power media can have over them. With one simple pop-culture reference, shock and horror flash across kids’ faces, as they suddenly understand how they’ve been manipulated by magazines and media. Many media and advertising messages are sneaky and covert. They easily implant inside young girls’ minds undetected and can grow into a virus that can consume their thoughts and feelings. Just like the “Imperius Curse”. It is my job to help girls wake-up and take back control of their thoughts and feelings about their bodies, and ultimately themselves. Several girls who’d been in an eating disorder program have shared with me, after my workshop, that they finally GOT IT – they understood how they’ve been duped into not liking their bodies and it took my pop-culture references to help them understand. It’s a perfect example of how media can be used for good. I have found through my workshops and interviews that girls respond if you speak their language; which means using references from Harry Potter, Lord of the Rings, and other popular fan-based fiction as tools to help illustrate messages and engage girls in topics they would normally tune-out. Suddenly self-esteem is cool and seen as a superpower, and they understand the power media can have over an “un-shielded” mind. I use pop-culture references girls adore, like Harry Potter, Lord of the Rings, Batman, Star Wars, and even Superman, to help them understand how they can use the “powers” their heroes have to overcome what oppresses them. Of course, they don’t all have to be superheroes. When I was a kid I adored Anne Shirley of Anne of Green Gables. She was strong-headed, creative, smart, outspoken, a free-thinker, and total romantic. She challenged the system, showed people new ways to see the world and stood-up to bullies. I used Anne as a role-model and adopted many of these qualities in my life: I stand-up to bullies in girl-related media and find creative way to handle obstacles. Parents can connect with a daughter (or son) to discuss just about anything using pop-culture references. Books, films, TV shows, and even cartoons and comic books are filled with characters who face similar challenges to us. If your teen is having a difficult time grasping a valuable lesson or concept, perhaps you can help them by involving a pop-culture reference in a creative way. Check out Dr. Who, Harry Potter, Star Wars, X-Men and The Hunger Games, just to name a few. Girls love the concept and are immediately attentive. Some girls even raise imaginary wands to dispel the negative messages the media cast at them! Learning becomes fun and self-esteem ‘shields’ grow stronger. Learn what pop-culture characters your daughter really admires. Watch the movies, read the books and find ways to integrate them into discussions on important topics. Yes, this can actually be fun! Select historical icons from women’s social movements and connect them to modern pop-culture heroines and presto – history lesson. Girls may begin to see the suffragettes as super-heroes standing up for truth and justice instead of “women from long ago who complained about equal rights for women”. 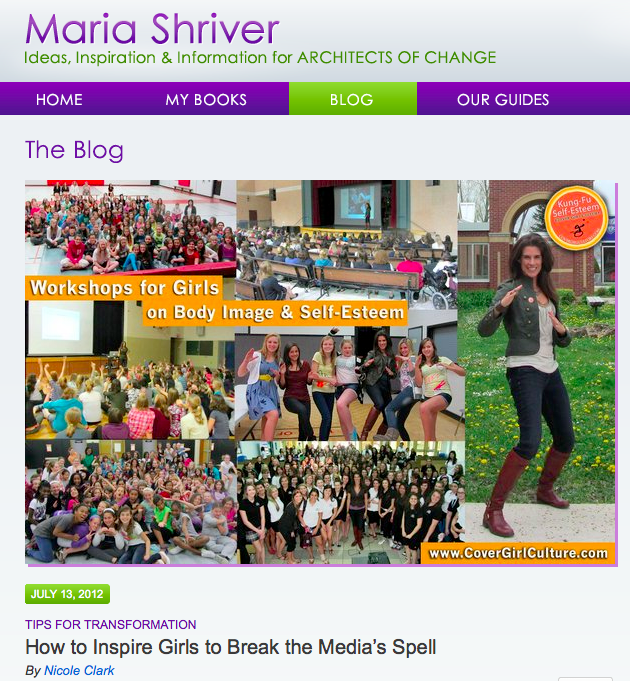 Challenge girls to research some powerful women who are creating positive change today. Compare them to pop-culture heroes and identify what ‘superpowers’ they are using to create social change. Have them take dis-empowering lyrics from popular music and re-write it as an empowering song. Every super-hero has a weakness they must overcome. The weakness is what bad guys prey upon. Have girls identify their own weakness…and find ways to strengthen it. Help create a Clever Girl Culture: one in which girls have full authorship of their lives and execute their rights to equality and dignity. Remember, you are her biggest role-model. Do you best to exemplify healthy self-esteem; what does it look and sounds like? Fake it if you must – and avoid body bashing commentary in front of your child. Exhibit heroic qualities in your life and language. Host a screening of Cover Girl Culture at your school or community (60-min DVD edition comes with follow-up questions/activities). Invite girls to discuss their feelings about how the media’s manipulated them. Encourage them to write letters or take action by starting an online petition or advocacy group in their school. I have found that girls want something to rebel against and push-back against, so encourage them to target media that attempts to undermine their health and mental well-being, and then let them flex their superhero GRRRRRL power. Encourage them to be like their media heroes and take actions that create positive change. They can write letters to the editors at magazines, producers of TV shows, or movies that sexualize young girls, use unrealistic beauty ideals, and promote size zero. They can sign this Change.org petition. We need our girls’ hearts and voices ignited with passion, compassion and action! Pop-culture can inspire girls to find their voices. If it works – do it. Find creative ways to turn on the lights and rouse girls from the spell they are under. Help them find their way out of the media matrix and become super-hero architects of positive change. One of my mottos: Are you afraid of stepping on toes or ruffling feathers? If the guilty party is manipulating children and young girls don’t hold back. Take names, wear boots, and dance on as many toes as possible. Get their attention and keep stepping until someone agrees to healthy change.